I hope I’m not causing any bad ’70s flashbacks with this color combination! I used these two colors partly because I was fairly sure the recipient would like them, and because their official names are Paprika and Thyme, quite appropriate for kitchen use. It’s a fun pattern, simple but interesting at the same time. 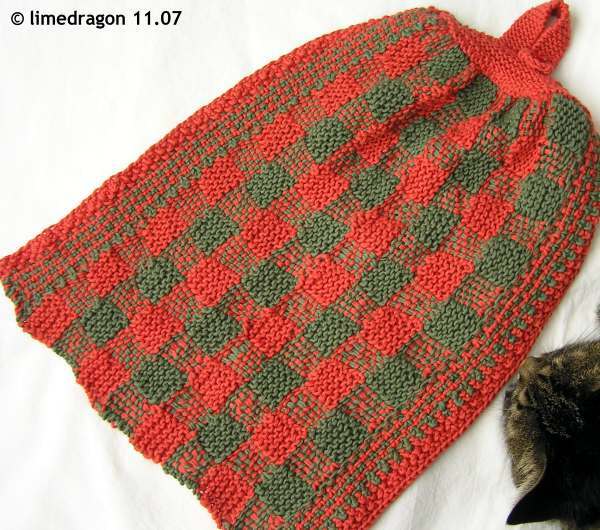 It’s also a bit challenging because the Gingham stitch pattern uses an odd-numbered row repeat before changing colors. I’ve done this before with other projects, but for some reason, I had a serious block with this project. I kept frogging or tinking back needlessly, or making too many errors. Things went much more smoothly after taking a break. I made one modification to the second Grid section (the two-color section before the cast-off edge). 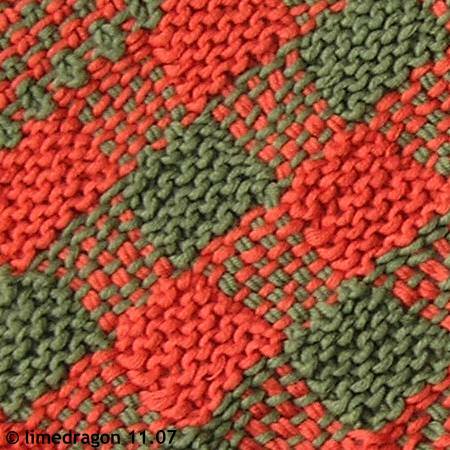 I added in two contrast-color transition rows after the Gingham section (to prevent slipping stitches of both colors in the first row of the Grid section). I knit one row with the green, and then on the WS, *K1, S1 wyib*, and ended with K2. With these two extra rows, the borders seemed more balanced. 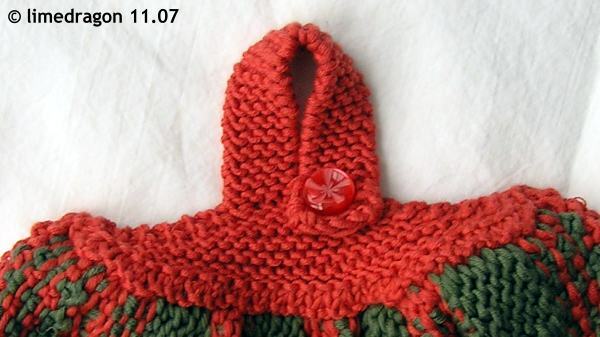 I couldn’t get the double-knit and crocheted handle given in the pattern to turn out properly. After ripping out several attempts, I tried a few new approaches until I finally settled on the reversible, uni-color version you see in the photos. I decreased the needle size to US 2.5 (3 mm) for a firm fabric. I liked how it looks, so I’m including the instructions here for future reference. Pick up and knit 54 stitches evenly along RS of left selvedge. Turn around to the WS. With another needle and same yarn, pick up and knit through the back loops of the new front stitches, to create another 54 stitches. Round 1 P all stitches on each needle. [K2tog, K1] 7 times, K2tog 2 times, K1, K2tog 2 times, and [K2tog, K1] 7 times. 66 stitches total (33 on each needle). Round 3 P all stitches on each needle. Repeat Row 5 until 9 stitches remain, ending with a WS. Bind off 4 stitches, 5 stitches remain, K to end. K each row until strap is desired length, minus 0.5 inch (1.25 cm), ending with a WS. Bind off on the WS. Attach button to RS, below the 4 bound-off stitches on handle body section. I love the retro kitsch appeal. The button is an estate sale find. I always thought it was reddish in color until I put it next to the orange and realized it was a perfect match. I’m thinking about knitting more towels for next year’s holiday gifts. It occurred to me that this towel pattern would also work very well if ten stitches were added for length and the handle omitted. If I knit my improvised handle again, I’d like to try several things: wider strap, two buttonholes to make the length adjustable, distribute the first decrease round over two rounds, and alternate the remaining decrease rounds with a plain K round. Very cute! It will make a great gift! Happy Thanksgiving to you too! It turned out really cute. I like that button a lot, too. Happy Thanksgiving! The button really completes the look. Can’t tell that you had any problems with it at all – it looks great! Very cool … I may have to try that. Perfect retro! Love it. Happy Thanksgiving. It’s cute! I think those were the colors in my first apartment. I really like it!! It looks woven from afar, but close up you can see it’s knitted. Very cute. That’s cute! I like the button too. It’ll make a nice gift. Cute – I’m thinking it would make a great housewarming gift. Very cute. And Happy belated Thanksgiving. I like that a lot. What a fabulous gift idea! Your towel turned out very nice! I like the checkerboard effect. You’ve actually captured the colors of my kitchen — avocado green and tangerine. My parents remodeled it in the 70s. Sigh. I love it! I love the colors too. I dig the colors, and the gingham is great! Oh, I do love that! 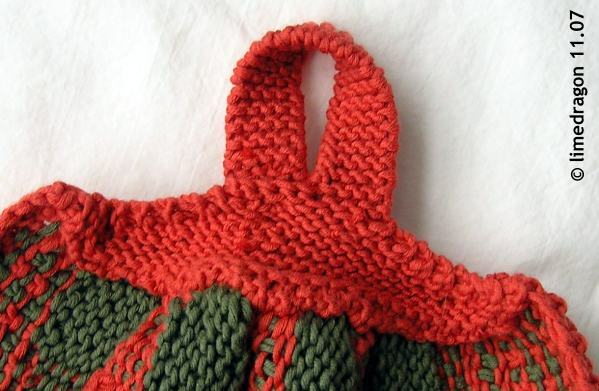 One of my first knitted gifts to my grandmother was a knitted kitchen towel like that. I remember the ladies at my LYS thought I was insane for knitting the towel, too, and not just attaching it to a knitted “handle.” What, me? do something easy? Oh I adore that towel! What a great present idea. Now to get the cotton for it!